After Torchlight 2 and the departure of two of Runic's co-founders, Travis Baldree and Erich Schaefer, company president Marsh Lefler says the team stepped back and tried to come up with something they "really want to play." 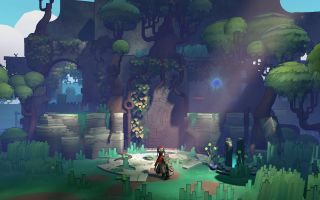 That's Hob, which drops us into an alien world with puzzles, combat, and no dialogue—the story is picked up through exploration and observation. Lefler says they were inspired by games like Ico and Shadow of the Colossus. I played a brief demo of Hob at PAX Prime, and I especially enjoyed the speed of the movement, which was so much fun it made it hard to slow down, take a breath and soak in the colorful vistas. The combat is tougher than the friendly look might imply, but definitely not a meat grinder—it requires some methodical timing, blocking, and stamina management, but health is pretty generous. It's a far gentler Lords of the Fallen. I had a chat about all this with Lefler yesterday, which you can watch above. There's no release date for Hob just yet, as Lefler says there's still iterating to do.